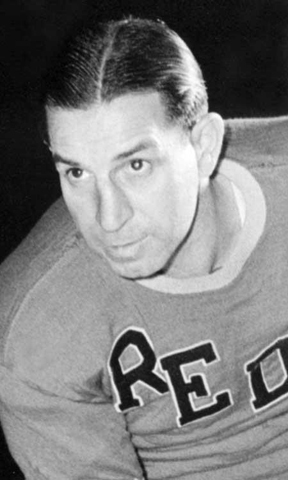 A “Class of 1963” charter inductee, sharp-shooting speedster Johnny Gagnon spent five seasons with Providence - 1927 through 1930, 1942-1943 and 1944-1945, scoring 57 goals and 39 assists in 176 games. One of 11 children and brought up in poverty, neither of his parents was enthused with his passion for the game. Indeed, his father would break his sticks whenever he caught him playing. At age 18, he left home to seek out his dream. His first club paid him the handsome sum of $10 a week, $8 of which went for room and board. The rest is history. Under contract with Montreal, he played brilliantly in an exhibition game in Providence in 1927. An impressed Reds management arranged with the Canadiens to loan him to Providence. The “Black Cat” as he was nicknamed, was a catalyst of the Reds’ 1929 Fontaine Cup championship team. The following year, he helped win the Stanley Cup with the Montreal Canadiens of the NHL. He was a veteran of 10 NHL seasons that ended in 1940. Over the course of his NHL career, Gagnon tallied 261 points, with 120 goals and 295 PIMs in a total of 454 games. After his playing career, he scouted for 13 seasons for the Reds followed by 14 more with the NY Rangers, discovering a host of talented players.